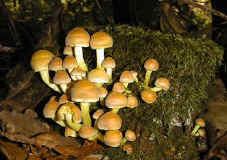 Images and information on selected British Basidiomycetes. This fungus is well named for the bright sulphur-yellow caps. The gills are also sulphur yellow initially. Habitat: This is a very common species which grows in tufts on the rotting wood of deciduous and coniferous trees. It can be found all year. The fruiting bodies are very variable, 6 - 15cm high. The caps are almost smooth and bright honey yellow to greenish yellow. This species can be a serious parasite of woodland trees, causing great economic damage. The fungus spreads by means of rhizomorphs or 'bootlaces'. These are black cables of collections of hyphae. This is a poisonous species. 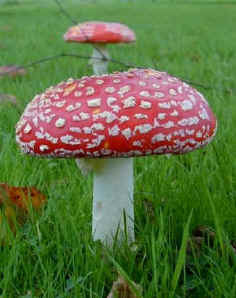 The red cap is covered with white pyramidal warts which may get washed off by rain. Habitat: with birch trees and occasionally in pine woods. The fruiting bodies are found late summer to late autumn. They may be found in 'fairy rings'. 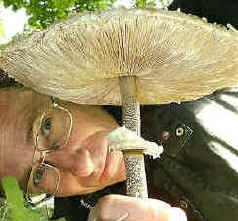 This is a large mushroom, up to 45cm high and with a cap of 10-25cm in diameter. Habitat: in open woods and fields. 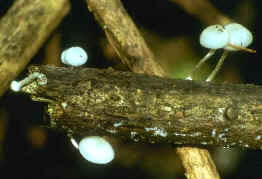 Fruiting bodies can be found through summer and late autumn. Spores are produced on crowded gills. 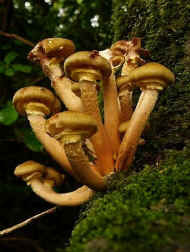 These soon break down to produce a dripping black inky fluid which contains the spores. 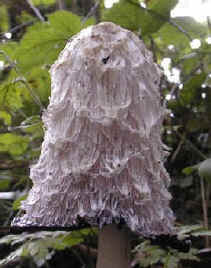 In the shaggy ink cap, the cap surface breaks down into large white shaggy brown-tipped scales. The fruiting body is 5 - 15 cm high. Habitat: In grass, on rubbish heaps, on disturbed soil. It is common late summer to autumn. The cap is pale grey to white, with a translucent sheen. It is slimy. The gills are white. Habitat: almost exclusively on the stems of Beech trees. They are often in clusters high up. They are can be found late summer to late autumn.